When most people today think of Chris Brown, they probably think of a great singer, dancer, or artist. Some may only be able to think of him as a mistake he made when he was 19. Others, due to recent photos and comments in the past few years may even consider Chris to be a somber, serious type of guy. I'd be willing to bet his true fans know though, that while Chris is very talented and can be serious at times, he is a total goof ball!! Chris comes off to me as the regular country boy who happens to be a huge star. He loves sports, partying, hanging with friends.. regular stuff. He tweeted the above photo yesterday mid a very intense Vice Presidential Debate and I cried laughing along with others on twitter. 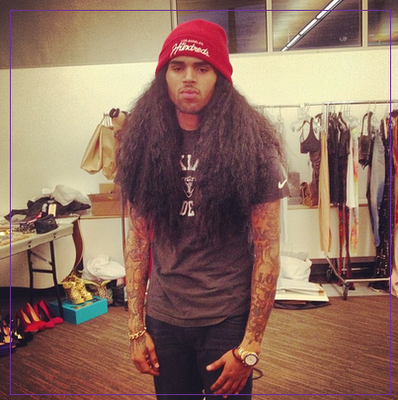 Chris threw on a wig on the set of his artist Sevyn's video shoot just for a little fun. It's totally something my little brother who is Chris' age would do. It definitely was pause for a good laugh. Just look at this guy! Cameras also caught Chris in rare form behind the scenes of his recently released video for single, Dont Judge Me. While the song and video treatment were no laughing matter, Chris and his irresistible energy gave crew members many laughs as they filmed. Check that out below! I love to see this side of Chris. That infectious smile we saw all of the time when he first appeared on the scene is everything! Considering the hatred he gets regularly he could very well let that change his silly, fun loving, & smiling nature. It may have even appeared for a moment that he had let it change him, but there is nothing a few Mama's prayers, love, the truth, and forgiveness can't make better. After so many somber photos, and so much fighting against what he can't change, I hope that he's finally just releasing himself of the burden of proof, and learning to enjoy life again. Just being the REAL Chris Brown. Just a country goof ball from VA who- is talented, loves his mama, figuring out life, and likes having a good time, because that is enough for the people who truly matter anyway. I love it! Enjoy your life Chris.